Hadi Shafaieh, known as �father of modern photography in Iran,� was born in 1923 in Tabriz. From the age of 10 he was infatuated with photography, when he barrowed a Leica camera from the photography section of his father�s pharmacy. He traveled to Tehran after high school, and he was interested in medical school and becoming a surgeon. However, based on his father�s advice, he studied pharmacy in Istanbul, which coincided with the World War II. Upon returning home he worked as a pharmacist in his father�s pharmacy for four years. But, he was never satisfied with that profession. He left the pharmacy forever in 1955 and started a photography business. He opened �Hadi Studio� that year. He took portrait, commercial, and industrial photographs. Some of his legendary works appeared on the cover of several books by famous poets of the time. 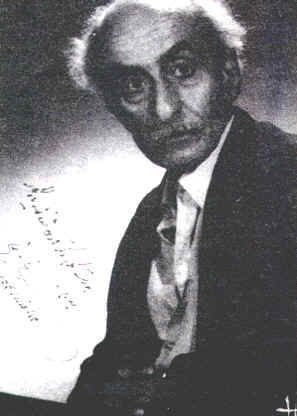 The portraits of famous artists, writers, and poets in 1950s and 1960s are among the everlasting photographs of Dr. Shafaieh. Respected authorities in France reviewed his works, and Louvre Museum was interested in exhibiting some of his photographs. Dr. Shafaieh made significant contributions by teaching photography to generations of students. He began teaching his beloved subject from TV in 1961. He wrote two classic books: �Photography� and �the Art and Science of Photography,� and published many articles in magazines. He also taught photography classes at several major universities until 1987. On invitation from the Ministry of Sciences in 1981, he designed the curriculum for an undergraduate four-year degree program in photography, which was then officially added to majors in Tehran University and University of Art. Hadi Shafaieh� s lifetime dream was realized when university students entered this newly added program for the first time in 1983. Dr. Shafaieh�s classes were always well attended as he was a master lecturer and loved his subject. He reminded his students that the camera is just a tool and that one can take good pictures with even the simplest camera. He valued and emphasized the work of the photographer-artist in the darkroom. And, he demanded his students to never bring out a photograph with even the slightest imperfection from the darkroom. His view of digital photography is less than favorable, as he equates digital photography to machine-made work and void of creativity. His other major contributions were in preservation of historical documents, albums, miniatures, and etc. from the Golestan Palace Library via copying old photographs. Some of those photographs have better contrast and clarity than their originals. His works in this arena from 1971-1978 appeared in an 8-volume series edited by Dr. Badri Atabai. Hadi Shafaieh left Iran in 1988 to live near his sons in Ohio, USA. Following a series of strokes, he has disengaged himself from camera and photography.